Since its birth in 1947, Pakistan has faced difficulties in its relations with India. Their relationship, which has been punctuated by occasional wars and armed conflicts, was hardly ever free of tensions and strains. Several outstanding disputes, particularly Kashmir, have bedeviled Pakistan-India relations from the very commencement of their journey as independent states. In view of this unhappy history and India’s geographical proximity, it is necessary for Pakistan’s policy makers to understand India’s strategic culture, goals and policies, and explore the possibilities of peaceful coexistence based on the principles of sovereign equality, mutual respect, peaceful settlement of disputes, non-interference in each other’s internal affairs, and mutually beneficial cooperation in various fields on a level playing field. Strategic culture can be defined as a nation’s distinctive body of beliefs, attitudes and practices regarding the use of force, which develop gradually over time through a unique historical process. In other words, strategic culture consists of common or shared ideas regarding strategy or grand strategy that exist across a people or a nation. Cultural attributes of a nation or people play an important role in shaping strategic decisions in the light of the realities of power and its distribution at national, regional and global levels. The understanding of strategic culture or attitudes, thus, can be a useful tool in the analysis of the strategic policies of a state. For understanding India’s strategic culture and the nature of the threat it poses to Pakistan’s security, one cannot ignore the teachings and advice contained in Kautilya’s Arthashastra written around 300 B.C. for the benefit of Chandragupta Maurya. This book is recognized by the India strategic community as an important guide on strategy. According to Henry Kissinger, “This work sets out, with dispassionate clarity, a vision of how to establish and guard a state while neutralizing, subverting, and (when opportune conditions have been established) conquering its neighbours” (Henry Kissinger, “World Order”). Kautilya asserted that contiguous states existed in a state of latent and permanent hostility. He argued that every nation acted to maximize its power, and moral principles and obligations had little relevance in inter-state relations. Kautilya recommended that a wise ruler should choose his allies from his neighbours’ neighbours. Thus, the enemy would become vulnerable when he is squeezed between the ruler and his allies. Kautilya also propounded the concept of “silent war”. Silent war, he wrote, was a kind of warfare with another state in which the ruler and his ministers—and, unknowingly, the people—acted publicly as if they were at peace with the opposing state, but all the while secret agents were busy assassinating important leaders in the other state, creating divisions among key ministers and classes, and spreading propaganda and disinformation with the ultimate objective of weakening and subjugating it. It appears from the arrest of Kulbhushan Yadav, a RAW agent, in Pakistan in March, 2016 on charges of fomenting, sponsoring and executing acts of terrorism in Pakistani territory, that the Indian authorities are implementing in various ways the advice contained in Kautilya’s Arthashastra. The same approach is reflected in India’s efforts to destabilize Pakistan politically and use Afghanistan for pressurizing Pakistan on the western front. The caste system in Hinduism, which is the religion of the overwhelming majority of the people in India, divides its followers into castes which are arranged vertically in terms of social status and rights. This caste system, because of impregnable barriers, prohibits vertical mobility as it is not possible for the member of a lower caste to move up into a higher caste. The untouchables, as the name suggests, are at the lowest level in this oppressive caste system, destined to lead a life of abject misery and deprivation. Logically the followers of other religions would be entitled to even fewer rights socially than the untouchables. To some extent, this cultural ethos of Hinduism also reflects itself in India’s inimical strategic outlook towards a Muslim majority Pakistan where the society is influenced primarily by the Islamic teachings of human equality and brotherhood. Indian policy makers and scholars continue to consider the creation of Pakistan as a major obstacle in the realization of India’s grand strategic goals. 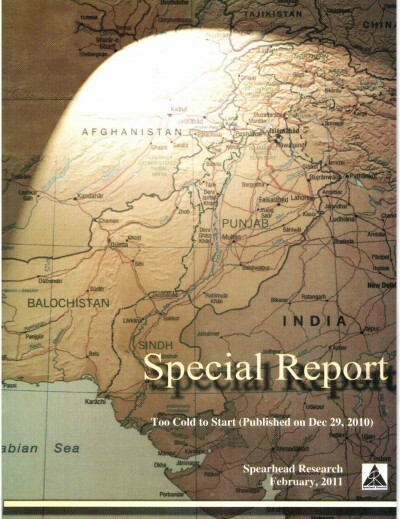 According to the well-known Indian security analyst, C. Raja Mohan, the creation of Pakistan left India with a persistent conflict with Pakistan and an internal Hindu-Muslim divide; separated India from Afghanistan, Iran, and, one may add, Central Asia; and created profound problems for India’s engagement with the Muslim Middle East because of Pakistan’s character as an Islamic state. (“India and the Balance of Power”, Foreign Affairs, July-August, 2006). India, thus, views Pakistan as a barrier in the fulfillment of its strategic goals and the establishment of its hegemony in South Asia and the Indian Ocean region. It should not be surprising, therefore, that since its birth, Pakistan has faced serious Indian threats to its security and economic well-being. This hostile Indian attitude was particularly evident in India’s blatant military intervention in East Pakistan in 1971 in violation of the principles of international law and the UN Charter. India’s handling of its disputes with Pakistan, particularly Kashmir, Sir Creek and Siachin, which it stealthily occupied in 1984, also reflects its enduring enmity towards Pakistan. The intensity of this threat has been exacerbated in recent years because of the growing appeal of Hindutva in India under the leadership of Narendra Modi-led Bharatiya Janata Party (BJP), a right wing Hindu nationalist party. BJP is allied with the hardline Rashtriya Swayamsevak Sangh (RSS), a militant Hindu organization. Both of these organizations are wedded to the promotion of the concept of Hindutva or Hindu nationalism, which seeks to define the Indian culture exclusively in terms of Hindu values. The combination of Indian hegemonic ambitions based on Kautilya’s teachings with the growing rise of Hindutva constitutes a toxic mixture giving India’s strategic culture an expansionistic character and posing a serious and long-term threat to Pakistan’s security. In the face of India’s hegemonic and expansionist strategic culture, Pakistan faces the challenge to work out a grand strategy which safeguards its security and promotes its economic progress. For this purpose, its grand strategy must bring into a coherent whole the country’s political, economic, security and diplomatic policies in the service of its national interests. Pakistan’s grand strategy should aim at accelerating its economic growth for ensuring its long-term security while maintaining a credible security deterrent, covering its conventional and nuclear dimensions, at the lowest level of armed forces and armaments to take care of imminent and short-term threats to its security. Domestic political stability and a proactive but low-risk and non-adventurist foreign policy would be the other essential pillars of Pakistan’s grand strategy. Unfortunately, currently Pakistan’s grand strategy is in a state of disarray because of economic stagnation and political instability which constitute its Achilles’ heel. Pakistan’s vulnerability in the face of the Indian security threat will persist as long as it does not resolve in a satisfactory manner the issue of guns versus butter in its economic priorities and decide whether the right to govern rests with the elected representatives of the people or unelected institutions of the state.